Organizers are available for others parts of the home. A tool organization cabinet can help you free up space in your home or garage, while keeping every tool and piece of equipment easily accessible for that next improvement project. With tools and gadgets for quite possibly every task and activity under the sun, clutter can build up quickly, even in a roomy, well-organized house. This is why it's so important to take those extra steps toward being both time and space efficient. When it comes to home improvement items, a tool organization cabinet can get you on the right track toward keeping fix-it projects simple and tools out o the way when not being used. An organized cabinet with everything in its designated place can also provide extra safety within the home. If you have young children, they can easily get their hands on power tools, sharp objects, chemicals, and other dangerous items if they are left out and unorganized. 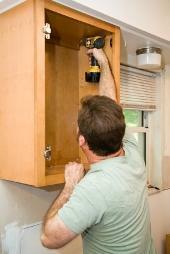 With a cabinet, you can add a locking feature that will prevent an accident before it happens. You can either build or purchase a tool organization cabinet. Most people will opt to buy, as it is much more convenient and a quicker solution. The last thing some people want to do is try to use an unorganized pile of tools in order to find a solution. Instead, you can purchase a cabinet that will suffice at many home improvement stores, and even through some online marketplaces. A suggestion list is available toward the end of this article. When purchasing a cabinet, you will want to keep a few things in mind. First, you need to decide upon what sort of material you want to buy. There are metal cabinets, and also wood and plastic options. If you choose wood, make sure it is a type of wood that can withstand the elements if your cabinet will be outside, and if it's plastic, ensure it can withstand the heat and/or cold sustained in a location such as your basement, attic or garage. Most cabinets are acceptable for all regions; however it doesn't hurt to ask the advice of a sales associate or fellow handyman if you are unsure. Next, you will want to purchase something that will provide you adequate space. You must have a spacious unit able to hold all of your tools and other equipment, however you don't want something so large that it does not fit in the storage space you had in mind. Measure the area of your home you wish to install your cabinet, and take these measurements with you to the store or your computer desk, depending upon whether you choose to shop at a retail center or order via Internet. Finally, draw up a budget for any extra features you want included with your cabinet, such as the aforementioned locks, custom shelving or a specific tool rack. You may also choose a rolling cabinet over a permanent mount so your cabinet can easily come with you if you move or rearrange your home. Home Depot, Lowe's, and Orchard Supply Hardware are ideal places to start your shopping. There is a large selection available, and there are even more ordering options available. IKEA is also a great place to find an organizational unit for your tools. If a physical location is not available near you, their online catalog system is. Smaller online stores also provide some ideal options. Car Guy Garage is one example, as they sell both wood and metal cabinetry. Garage Tek is another web presence worth visiting, as their catchphrase is "the world's cleanest garage," which, after all, is what you probably hoped for in the first place! With so many options available to you, you'll be able to get your tools and other fix-it items organized and in tip-top shape much more quickly and efficiently than you ever imagined.